Actually, with his photos. On the spur of the moment, M and I decided to go to Jo Hyun-Jae's photo exhibition in Osaka. It's very last-minute, rush-rush, but with super-efficiency we took care of all the logistics in two days. We met up in Hong Kong and left for Osaka on Friday, Feb.13 (Black Friday!) As soon as we checked into our hotel, we headed straight for the exhibition site in Kintetsu Department Store which was right next door. A little to the left were two BIG framed photographs on stands. Two? I did a double-take -- Hyun-Jae was on the left, and his friend Lee Dong Gun was on the right. Turned out this was a joint photo exhibition (but in name only -- because everybody came for JHJ.) The photos were surrounded by gorgeous baskets of flowers -- all for Hyun-Jae. The Hyun-Jae photo was basically the same one as the one at the entrance, but this time he's not smiling, just looking cool! Several more giant posters came into view. We greedily devoured everything -- it's a visual feast! Then we saw a young lady sitting at a desk (turned out to be a staff member of the official JHJ Fan Club. ) We asked her if we could buy the posters and she said No. "But we came all this way just for this!" "But you still can't buy these posters because they're not for sale." "Let's check out the photos first," I said to M. (After all, that's what we came for.) 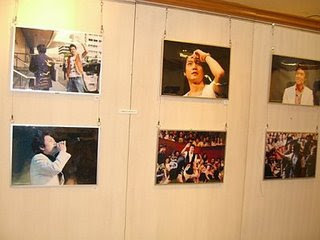 The first photo was a bird's eye view of the June 23, 2008 Tokyo Fan Meeting, second part (JHJ in casual clothes.) I scanned the packed auditorium but could not find myself. The other 40-something photos were mostly taken at either the Tokyo Fan Meeting or Osaka Fan Meeting (June 22, 2008), plus Hyun-Jae in T-shirt and jeans at rehearsals and entering the venues. Two were of Hyun-Jae at the "G.P.506" press conference. 緊鄰著的是個播放 " 最後的故事" DVD的小放映室 ( 那裡從不缺少觀眾 )‧那真是個震撼當我聽到我自己那靈魂出竅般的聲音在說：" 北京, 中國 "‧那是在大阪影迷會上值得紀念的一刻，海外粉絲被邀請上檯，每個人都被問到他/她從哪裡來‧當然接下來的就是我們中的七八個人與顯宰玩 " 剪刀石頭布" 而我輸了 ( 唉! ) 最後的幸運贏家是台灣來的 Greencup 及一位可以名垂千古的在影片中出現超過一分鐘的韓國CAFE會員. There was a notice board on which fans posted messages for Hyun-Jae. There was hardly any space left, but I managed to squeeze one in at the bottom -- "Dear HJ, You are my favourite actor in the whole world!" 95% of the messages were written in Korean which really surprised me. Presumably most of these messages were left by JHJ's Japanese fans, so either: (1) they were all proficient in Korean, or more likely, (2) they all prepared a message in Korean. And all I could write was Hyun-Jae's name in Korean and "Fighting!" 在那裡有一處粉絲們能留言給顯宰的布告欄‧幾乎已經沒有任何空位留下來了，但我還是在底部努力的擠出了一個位置----" 親愛的顯宰，你是我在整個世界中最喜愛的演員！" 讓我驚訝的是95%的留言都是用韓文寫的‧可以假定說絕大多數的留言都是日本粉絲留的，所以 (1) 她們都精通韓文 ,或(2)他們都事先準備好韓文的留言‧而我所能寫的只有顯宰的韓文名字和 "Fighting!" We went back to Miki, the official JHJ Fan Club staff, and told her we wanted to join. She asked if we had a credit card because they did not accept cash. I left M to start the process of registering while I wandered all over the place again. And I walked around (occasionally sitting down) for more than an hour (no exaggeration) and she's still not done. Problems: telephone number not accepted, e-mail address not accepted, credit card not accepted. They tried and tried. We used all four credit cards (from different international banks) that we had between us and all were rejected. Miki said foreign credit cards usually had this problem. By the time I could memorize all the details at the exhibition site, I told M it's time to give up. We're doomed to be on the outside looking in. We were going to take one last look and call it a day. And then we remembered it was Black Friday. It's Valentine's Day! We're going to spend Valentine's Day with Hyun-Jae! (or rather his photos.) The very thought warmed our hearts. At 9:50 a.m. we were already waiting at the entrance of Kintetsu. When the second hand of the clock hit 10 p.m., we were allowed to go in. We headed for the lift, went up to the 5/F, and made a beeline for that smiling JHJ photo. 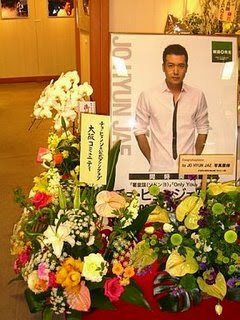 The first thing we noticed was a new flower basket (from JHJ's Hiroshima fans.) The placing of this basket caused the Lee Dong Gun photo to be obstructing somewhat Hyun-Jae's. M and I looked at one another, and without a spoken word, we rearranged the two photos, so that Hyun-Jae's was now (slightly) in front. No staff was up and about yet, so with professional speed we snapped pictures of everything. Until we got caught red-handed and were scolded (in polite Japanese way.) We just bowed and smiled, and our skin thickened by an extra mm. Then we posted new messages on the notice board. Several messages were taken down (including ours of the day before) because the board was full, I suppose. This time we wrote in Chinese: I also wrote one for JoHyunJaeChina and JoHyunJaeTaiwan and another one for JoHyunJaeHongKong -- to wish Hyun-Jae Happy Valentine's Day and happiness forever. We bought more JHJ souvenirs. We reckoned this was the most direct and practical way to line Hyun-Jae's pockets while he was drawing a soldier's pay. M bought another wall calendar, and the shop girl gave her a bag that could only hold half of it. We solved this problem by going to the Bedding Department (on a different floor) and asking for a big shopping bag (the kind used to hold pillows or blankets.) JHJ fans are smart people! Makky and Bell took us to Osaka's Korea Town where we had lunch (in a Korean restaurant, of course!) We exchanged notes and traded tidbits about Hyun-Jae. Makky's JHJ site's anniversary was coming up on February 24. We told them of our plans to start this English blog. After lunch we went to source (unofficial) JHJ souvenirs, most of which we had already bought in Seoul. After saying good-bye to Makky and Bell around 5 p.m., we went back to the JHJ photo exhibition. We were pleasantly surprised it was still pretty crowded. Many of the JHJ souvenirs were gone, but the CD had still not arrived. I asked the shop girl and she made a phone call, after which she just said "Wait" (in Japanese.) I waited 10 minutes and asked her to call again, with the same result. I waited another 5 minutes and "made" her call again. I stood right in front of her and exerted some pressure with my formidable presence (Ha!Ha!) Actually I just looked at her beseechingly, but that was enough to produce results. She got off the phone and held up 3 fingers, struggling to find the English words. I suggested hopefully: "3 hours?" "No, no, no." "3 days????!!!!" I shrieked. "No, no, no." She got agitated and then disappeared behind a door. I was trying to decide whether I should pursue her when she reappeared with another shop girl who uttered the magic words: "30 minutes." Thank God! 3 fingers meant 30 minutes? Oh, well! M had gone back to our hotel to deposit our spoils (JHJ souvenirs bought at the exhibition earlier and at Korea Town), so I whiled away the time by watching the "Last Story" DVD again. No sooner had I pressed "Start" than all seats were taken. Again, I gave up my seat to a fellow fan since I had watched this video so many times already. I timed my watch, and, as soon as 30 minutes had passed, I went up to the counter again. The girl saw me approaching and held up the CD, half in protest, half in surrender. She was going to charge it when I said: "No!" She looked shocked but I smiled and held up five fingers. "Five?" Boy! Was she impressed! "And another photo album." 我看著我的手錶計時著，當30分鐘一過，我馬上又來到櫃檯邊‧那小姐看見我走近，馬上舉起了CD，帶著一半抗議、一半投降的神情‧當她正準備幫我結帳時，我說："不要!" 她看起來吃了一驚，但我隨後微笑的豎起了五只手指頭‧"五張?" 天哪! 她真的有點被嚇到了. "還要一本寫真集". I met up with M and we did the rounds again, scrutinizing each photo of Hyun-Jae, committing it to memory. Poor Lee Dong Gun! His photos were totally neglected, as were his souvenirs. Out of pity, M bought one of his cell phone straps (for old time's sake -- he was an old flame.) There were also lots of souvenirs of other stars like Pei Yun Jun, Kwon Sang Woo, and Lee Byun Hyun -- photo albums, photo sets, necklaces, rings, magazines, Valentine stuff -- but there were no takers. Everybody who was there came for Hyun-Jae. We were about to leave for dinner when we ran into that Japanese lady again. This was the JHJ fan who bought a wall calendar but had to clutch it under her arm. We tried to tell her at our second chance encounter that she could get a bag big enough to hold it on the 8/F Bedding Department, using sign language and writing Chinese and drawing pictures. We were now meeting for the third time in one day, and we could see she was carrying the wall calendar in a big shopping bag. She rushed up to us and shook our hands, saying "Thank you" in Japanese over and over again. JHJ fans looked out for one another, that's all. M said: "Has she been here all day?" I said: "She could say the same about us." 當我們準備離去用晚餐時，我們又再一次偶遇那位日本女士‧她是一位買了一張顯宰掛曆後不得不把它夾在臂下的粉絲‧稍早前當我們第二次遇見她時，我們曾試著用手勢、寫漢字及圖示的方法告訴她可以去8樓寢具部門拿一個大到能裝得下掛曆的袋子‧現在我們已經是一天中第三次相遇了‧我們看見她提著一個大大的裝著掛曆的購物袋‧她急匆匆的走向我們並與我們握手，一遍又一遍的用日文說著:"謝謝"‧ 其實 這沒什麼，趙顯宰粉絲們本來就會互相照應的‧"她是不是在這裡待一整天了?" 我說: " 她也可以這樣說我們‧"
We went downtown and looked around for a place to have a "romantic" Valentine's Day dinner. We saw many young couples going down a dark flight of stairs and caught the name of the restaurant - "Love". That's it! Let's try this. After venturing down two flights of stairs, we found ourselves at the foyer of the restaurant -- with a bridge and stream! We were led to our private cubicle after traversing alleys and steps. And we had our own Osaka JHJ as our waiter -- a fresh-faced good-looking kid (a trainee) who resembled somewhat Hyun-Jae in "First Love". We enjoyed the decor, the ambience, the service, and, of course, the food. We only wished it wasn't quite so dark so we could read the menu more easily. Our Valentine Day's adventures came to an end with our listening to Hyun-Jae's songs which accompanied us into deep slumber. Our flight was scheduled to depart at 6:25 p.m., so we still had the whole morning to spend at the photo exhibition. We were there promptly at 10 a.m.
We did the usual routine -- took more photos, watched the video (for the Nth time), checked out the souvenirs, and posted more messages. We were like two old-timers, even acting as volunteer ushers -- directing newcomers to the right sections. We loitered there all morning, savouring every moment, saving every data on our P.C. (memory) -- they had to last till at least June 2010. We saw a Japanese man who was acting suspiciously. Actually he was openly taking pictures and videotaping which was suspicious since such activities were supposedly prohibited. We guessed he must have been commissioned by the authorities. Since M and I could only take photos of one another, I decided to give this professional a chance to prove his skills. I asked him to take a picture of M and me, actually two -- one with JHJ's breathtakingly handsome photo at the entrance and one with the flowers. The latter included Lee Dong Gun, unfortunately, because the man apparently did not understand my sign language when I indicated I did not want Lee in the picture. The whole of Lee was there in the photo, but I lost half of my right arm. Professionals do things differently from you and me. M and I did one last round -- to make sure we didn't miss anything. And then we said our Goodbyes to Hyun-Jae. I don't know if M would kill me if I reveal here HOW we said Goodbye. We looked lingeringly at those big posters (the ones outside) and we couldn't help but caress Hyun-Jae's face.....and hair.....and eyes.....and nose.....and ears........We even contemplated (for a crazy moment) stealing the posters (the official fan club staff was off on weekends), but desisted for fear of making newspaper headlines. And we almost missed Hyun-Jae's autograph! As we were leaving, we noticed two panels (facing outside) covered with writing. On closer examination, we realized those were stars' signatures. We quickly scanned for Hyun-Jae's which was difficult to find (even though it was right in the centre of one panel) because it was easily lost amidst all the other more fanciful names with flourishes. His signature was pure and simple and had no decorations, unlike many of the others. after lunch at a restaurant called English Teatime in Kintetsu, we took the train to Kansai Airport. We were listening to Hyun-Jae's songs on our MP3s and almost didn't hear the announcement that cars 1 - 4 were going to Kansai and cars 5 - 8 somewhere else, and that the cars would be disconnected at a certain station. As it turned out, we were in car 4. In the course of eight months (since June 2008), I have become a seasoned star-chaser. But the only star in my firmament is JO HYUN-JAE. 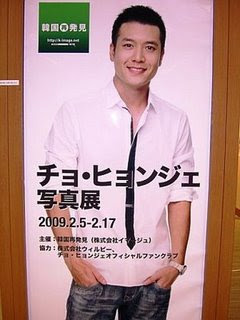 NOTE: Jo Hyun-Jae's Photo Exhibition was held in Osaka Feb. 5 - 17, 2009.